The first unit at the Sirte Gulf Steam power station restarted work yesterday (archives). The General Electricity Company of Libya (GECOL) announced yesterday that the first unit at the Sirte Gulf Steam Power Station is now operational. In its statement, GECOL proudly announced that ‘‘thanks to the efforts of the technicians and engineers of GECOL, the first steam unit at Sirte Gulf Steam Power Station joined the national electricity grid which will hopefully contribute in reducing the number of hours of power cuts’’. It went on to thank all those who participated in the success of returning the power station into operation ‘‘despite of the difficult working conditions’’. It will be recalled that the area where the power station is located, around 30 kms west of Sirte, was only recently liberated from IS/Daesh control by the Bunyan Marsous (Solid Structure) Operation Room led by Misratan forces and affiliated to the Faiez Serraj-led Presidency Council/Government of National Accord (PC/GNA). 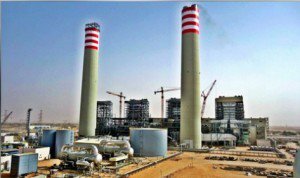 The Sirte Gulf station has four steam units producing 350 MW each. Construction was started on the station in 2008 but stopped as a result of the Libyan Revolution in February 2011. Work restarted in September 2012 and the first unit had started operating in May 2014 only for work to stop again when all foreign contractors had to leave the Sirte area in August 2014 with the increased insecurity and IS control of the area. The company says 67 percent of the project is complete. The operation of the first unit at the Sirte Gulf station and its 350 MW of electricity will come as a welcomed relief to both the Libyan public as a whole and the Faiez Serraj PC/GNA. Yesterday, for example, GECOL had announced that its total generation capacity was 4,773 MW, and estimated that total consumption would be 5,700 MW. This would have left it with a deficit of 927 MW translating to an average 5.4 hours of power cuts. The addition of 350 MW of power from Sirte Gulf station could potentially reduce its deficit and hours of power cut, on average and all things being equal, by a third.